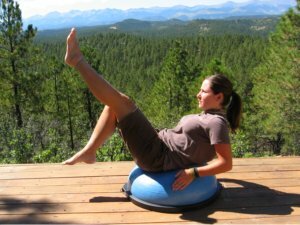 The Bosu Balance Trainer is a tool to help you perfect your balance and core strength together when you do core strength training on the Bosu Ball. 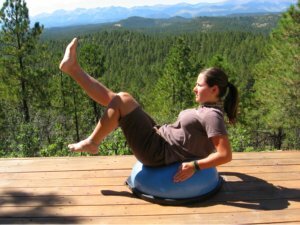 This article is a continuation of my article Bosu Exercises for Core Strength Training ~ 1. A beautiful, evenly toned, strengthened and balanced body and will keep you injury free and protect your back. It will help you achieve poise and gracefulness, vital elements as you age. 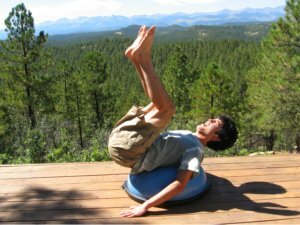 Go get your Balance Trainer and lets continue with the 2nd article on core strength training. 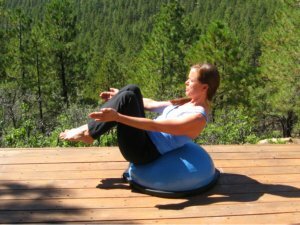 The Bosu Ball is a wonderful tool for core exercises, in addition to balance training. 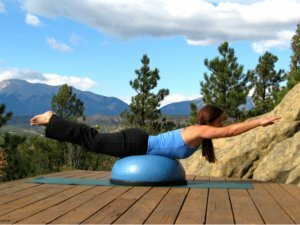 Because your core and balance go hand in hand, it can aid you in achieving both. Body-mind balance in all things will keep you young and strong! So, go deep into the core of your being, when you focus on your improving balance with these poses and movements. Begin with the improvements in core strength and balance in you body to initiate the changes you desire in your mind, your heart and in your life. Say positive affirmations while you do your Bosu Ball exercises: My body, mind and soul are perfectly balanced in all things! 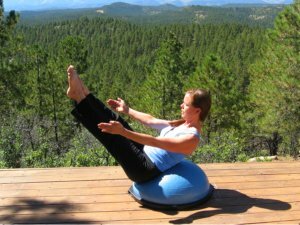 When you do these core strength training exercise on your Bosu Ball, and you do them meditatively, you are doing movement as medicine to heal your body-mind-soul! My stepson, Alex and his friends continued to help me with the poses on this page. They started out with sitting balance exercises. I showed them the Boat Pose, and they began creating their own versions of the pose. Here I am, below, doing the boat pose, no hands, in a modified position, with legs bent. Then, in the full boat pose position with my legs straight, below. I only felt comfortable with my derrière towards the bottom of the ball, because it was the best way I could get the great balance along with a good form. If you can do this pose with your derrière all the way on the top, please send me a picture of your feat, in the invitation below! I would love to post it as a page on my website to show that it can actually be done. 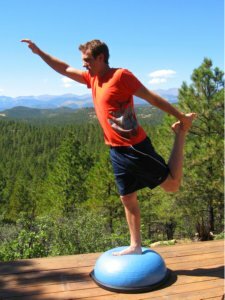 I continually experiment with my balance and my form on the Bosu Balance Trainer. Then Chelsie had fun with this Boat Pose variation. You can change legs to balance the position on each side. 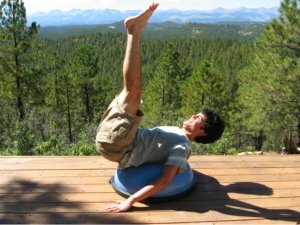 Alternate leg positions, with repetitions to get a great abdominal work-out. 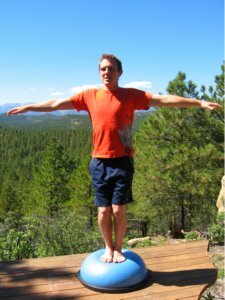 And finally, the simple movement on the Bosu Balance Trainer that dynamically engages your core and requires incredible balance is the "Get Down Get Up" movement, shown in the next video. You can do this fast or slow. I chose to focus more inwardly and do it slow and meditatively. It is a great overall warm-up and fitness movement as well and if done fast, is a great aerobic work-out. 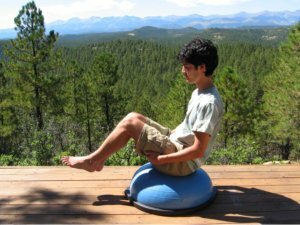 Congratulations on your journey to body-mind balance on your own home Bosu Balance Trainer! As you work on your balance and on your core, you will find your own balance and personal strength in everything in your life! 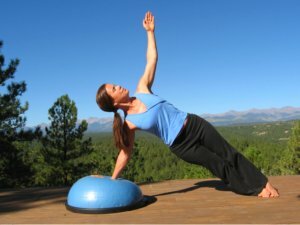 May your healing and physical well-being be enhanced by these Bosu Ball core strength training exercises!